This post is brought to you by Ariel laundry detergent. 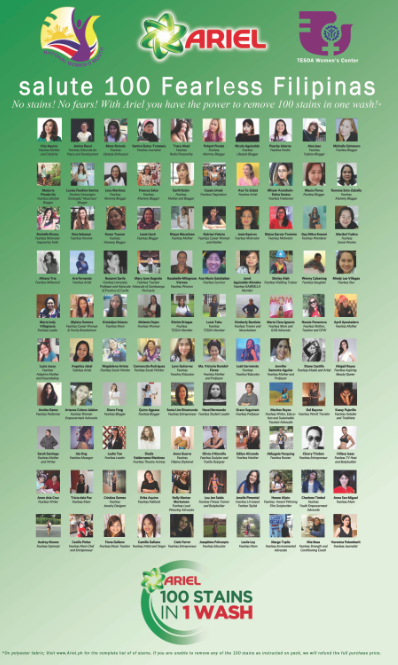 Today, on the last day of International Women's Month, Ariel honored 100 Fearless Filipinas by publishing this ad on national broadsheet, Philippine Star. A hundred women — rich and poor, career women and homemakers, young and old — all doing their best to make the world a better place, especially now that the world seems to have become a darker place. I'm one of the 100 Fearless Filipinas and I am truly honored. I'm also a lot surprised and when I expressed it, they told me they thought I had to be on the list because of how I've bravely chosen to work from home and for all the honesty this blog is known for. Well, freelance work is not easy. In the five years my husband and I have been doing this, delayed checks and no projects can be stressful. I try not to worry. Believe me when I say I don't spend my days nibbling on my nails in fear. I really don't! But on those days when the bank account is nearing zero, I do cry out to God in alarm. When you're a parent, your biggest fear is not being able to protect and provide for your children. But I refuse to parent out of fear. I grew up in a home with no money. There was always so much anxiety. There was dread when the phone rang or when the mailman delivered the bills. There was shame when we visited relatives and they all looked down on us. There was the humiliation of being the only house on the street with the electricity cut off. There was always that nagging worry. Worry, worry, worry. That's part of the reason I didn't want to become a mother. I couldn't fathom raising children in that bubble of fear. So I worked so hard, forsaking almost everything so I wouldn't be poor. I guess I finally came around the idea of motherhood when I started earning well — when I was 32. With our combined income, my husband and I had more money than we needed and we spent it shopping for our new home. We had no debts. We had fat savings. It was time to have kids! We had Vito and then we had Iñigo. And then we lost our jobs. You can't imagine the intense fear I had in 2012, dear Loyal Readers. I was losing my job as a magazine editor but I was being offered a great position within the company. Nothing had to change! Yet a huge part of me longed to be a stay-at-home mommy. Imagine that! I was so happy being a mama, I had to choose between job security and mommy heaven. I guess you all know which one I chose. Just before I had to give the company my decision, I remember spending one weekend in agony. My childhood was haunting me. I remember an interview I did with Ryan Agoncillo and Judy Ann Santos, and Ryan revealed that his wife's greatest fear was to become poor again. Surprised, I said, "But — forgive me for this remark — you have so much money. You're both so successful. How can this even be in the realm of her imagination?" And he replied, "You know how her dad left them and they suddenly had nothing? She never wants to go through that again." And that was me in 2012. Gripped in paralyzing fear. I never want to be poor again! I confessed this fear to my prayer group. Remember my Praying Wives group? Amazing women! Earl Paolo, our ringleader, told me that it isn't me or Vince who is the provider of our family. It's God who provides, and He just uses me and Vince as the conduit of blessings for our little boys. According to our faith, He will give. Of course we must work, too, but there will be days when we can't work — we're sick, for example — but the blessings won't ever dry up as long as I just believe God will provide. There were many verses on God's provision that Earl gave me but the one that helped me most wasn't about God's faithfulness but about the lack of my belief. what God's will is—His good, pleasing and perfect will. That verse! That is the verse that changed my life! Even now as I typed it, I was moved to tears. Do not conform to how this world thinks! Change how you see the world and the world will change for you! I don't have to work myself to death. I don't have to repeat the life my parents led. I don't have to be afraid. Believe in God — test Him! — and He will do wonders. 1) My blogs (back then I had two blogs) suddenly took off! Both on number of visits and amount of sponsorships. Like, from 30,000 views a month to almost 60,000. I have no idea how that happened. I give workshops on how to build and grow blogs but what happened to mine was so organic and so weird that I just chalk it up to divine intervention. 2) My blogs earned me more that I ever did as a magazine editor. Huge surprise! The income allowed my husband and I to stay home, raise Vito and Iñigo, and make Piero! We are both hands-on parents. Literally just at home with our kids every single day. We have a good life. We have good food. We buy lots of toys and books. We have the A/C on every day! I can't complain! 3) When the clients aren't paying, that can be terribly frustrating. In theory, I have all this money but in reality, my bank account is almost empty. That just doesn't make sense! It doesn't happen all the time, okay. We're fine most of the time but there really have been days when I'm staring at the bills and telling God, "I know You have provided because I have so many projects but please help me!" And then suddenly a check or two is available — sometimes just enough to pay for that month's bills, sometimes a lot more. It's exciting, this life! You can see it as stressful or you can see it as exciting. Renew your mind! So all I want to say, dear Loyal Readers, is I live in hope and faith. Despite how I grew up, despite all the fears I had, despite all that I do, my life is lived in hope for all things wonderful and that's why it is wonderful! Sure, my husband and I deserve credit because we always try to make good decisions. But sometimes even good decisions don't have the expected results, sometimes no matter how you work hard the money doesn't come, sometimes no matter what savings you built the economy crashes because of outside forces (sigh!). But it's okay. God is sovereign over all! It's okay. Don't worry. Give it up to God. Pick yourself up. Carry on always. Don't stop moving. Always believe. That's the secret to my fearless life. A renewed mind. A hopeful heart. A faithful God. May you have these, too! God bless you! Thanks for sharing this Frances! Let me also share one story how God provided for my family. We had to transfer our daughter to another school mid-year because we moved to a new place. I didn't expect it to turn out to be expensive as it did and found myself with no money to buy her new set of textbooks. I was just new to the Christian faith so I told my husband "We will not borrow money for this. God will provide.". I waited for someone to give me the money for it but no one did, so I let my DD go on her 1st day of school without books. Lo and behold, a kid from that school also had to transfer mid-year and left all her books and the teacher gave it to us! We never really know how God will do it, but it's always perfect! Wow, that is amazing, Bianca! Too specific for it to be a coincidence! Thank you for sharing this story. It affirms my faith and my belief in God's provision and grace for His children! You are always an inspiration to me. God bless you more. Thank you, Maye =) God bless you, too!